Gen 1 Montero - perfect fit. Don't be bashful about deleting wires you don't need; for Gen 1s, you can lose the blue wire for a powered antenna, and the orange/white for illumination dimming. Wiring Harness: This wiring harnesses prevent you from having to cut your vehicle's factory radio plug when replacing your factory radio with an aftermarket head unit. Simply solder or crimp the wiring harness to your aftermarket head unit's harness (solder & crimps not included), plug the aftermarket head unit's plug into the rear chassis of the aftermarket head unit, and plug the wiring harness into your vehicle's factory radio plug. No Ground Wire: The wiring harness does not included a ground wire. You will need to ground your aftermarket head unit directly to the vehicle's metal chassis. 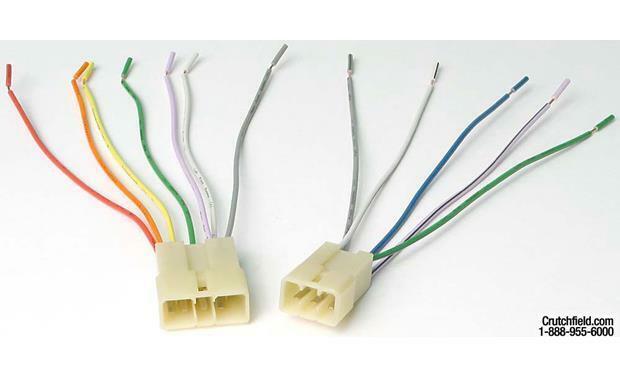 Searches related to the Metra 70-1743 Receiver Wiring Harness Connect a new car stereo in select 1987-96 Dodge, Chrysler, Plymouth, Eagle, and Mitsubishi vehicles.